In my last post, I showed off two new additions to my Gold Script collection. They were part of a three card deal, and this next card would be the third one I was referring to in that post. It's a Jochen Hect Super Script numbered 11/25. It's nearly impossible to see the rainbow foil facsimile signature in the scan, but it's there. These cards look so much better in hand, especially with the color changing rainbow foil. This one brings my Super Script total to 17. It's only the third one I've picked up in 2011, not bad for such a rare set. Hopefully this year brings me a few more of these, whether that be through ebay, trades, or anywhere else. I've decided that anytime I come across an opportunity to add a new one to the set, I cannot pass it up unless the price tag is absolutely outrageous, thankfully most of the time it isn't. I've just seen too many of these slip away. The last time I added to my Gold Script set was back in September of last year, and that was only one card. Before that, I hadn't added anything since last January when I bought the first lot of ten. Now, I've got two more to add to the collection, thanks to a trade on SCF. The first is this Joe Thornton numbered 073/100. 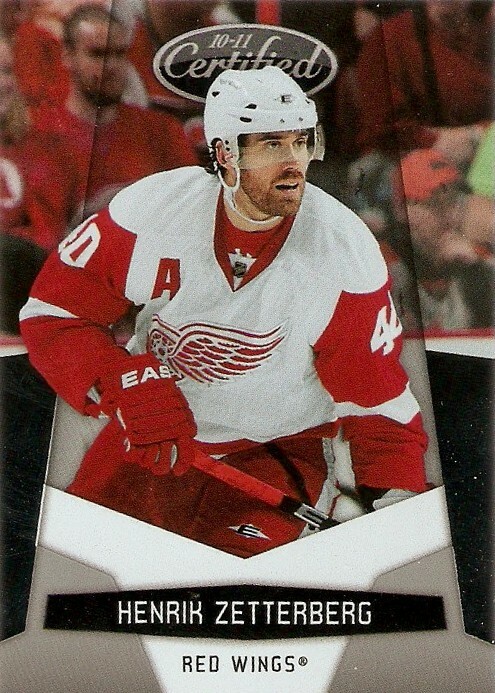 The second is this Simon Gagne numbered 002/100. What's unique about this addition to the Gold Script collection is where these cards came from, and that would be Finland of all places. I was searching the web for cards from the set and came across a collector's trade page that listed these cards. I contacted them and negotiated a deal, $33 dlvd, for these two and one other card, which I will share in another post. I actually received them pretty quickly in the mail, and by quickly I mean only a week. I've had cards coming from Canada take three times as long, so that was definitely a nice surprise. These two bring the Gold Script set to 12, not including the one Jose Theodore duplicate I have. That's 12/220 or just about 5.5% of the entire set. This set has been a bit slower than the Super Scripts, which doesn't make sense, as there are four times as many of these. This pick is another one that just stood out when searching through my collection. 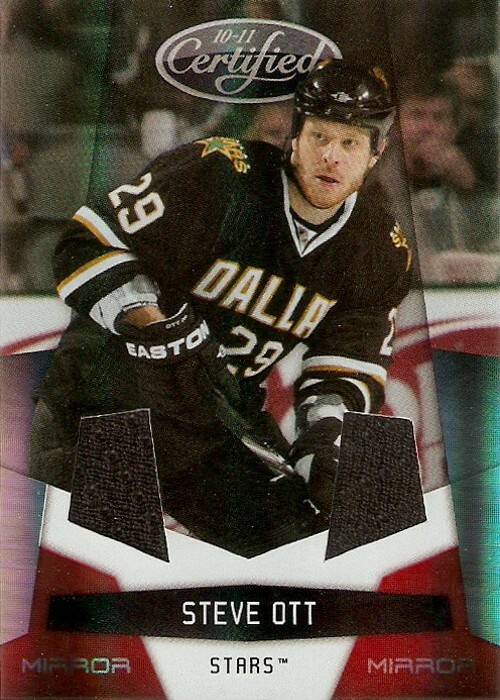 It's a Mike Dunham from 2001-02 UD Victory, back when Victory actually looked like a halfway decent set. There are a few reasons this one stood out to me. The first would be the water bottle and the second would be the fact that you have a shot of a goalie on the ice with no mask on. There aren't usually a lot of cards with these non-action shots, so that's kind of neat. 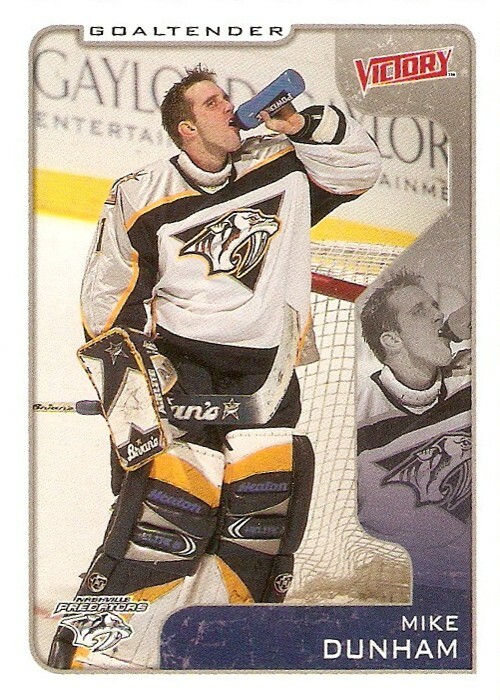 Beyond that, I just really like this particular Predators jersey, much more than their current road jerseys. It's got an excellent logo, a great combination of colors, and something a bit different in the silver fabric on the shoulders. As far as the design of the card, I like it. It's pretty simple with some neat elements thrown in, like the ice-like surface in the background of the sidebar and the fading to the team color at the bottom. The only thing I would have changed would be the use of the same image on the sidebar as the primary image on the card. I think it would have been nice to see something different there. One thing this card does is make me want to see just how many cards with goalies taking a drink from the water bottle (like this one over at My Hockey Card Obsession) I can find. I'm sure there's a few of them. This edition of Captured on Cardboard features another game dated card from 1997-98 Upper Deck, the third one to be featured now. This one captures another moment from the 1997 Stanley Cup Playoff series between the Flyers and Rangers. First, let's look at the photo on the card. You've got Rod Brind'Amour looking on as he puts the puck past Ranger goalie Mike Richter in Game 5 of the 1997 Eastern Conference Finals. 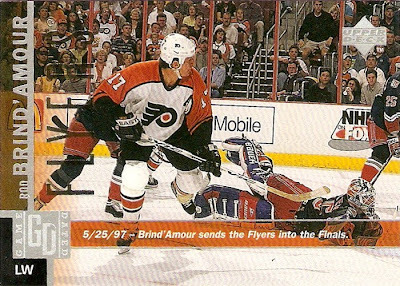 That goal put the Flyers up 4-2 late in the 3rd period, setting up a memorable Detroit-Philadelphia Stanley Cup Final in which the Flyers were easily swept. As far as the YouTube video, this one was a little more difficult to track down. Luckily I came across a highlight video for the entire game. The photo seen on the card above was taken at about the 6:10 mark. 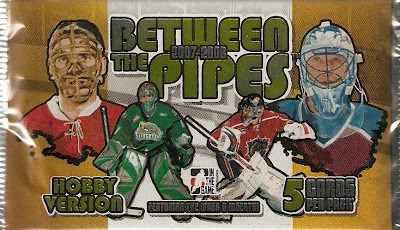 Now that three of the five Captured on Cardboard picks have come from these 1997-98 UD game dated cards, I'm on the lookout for more cards that just happen to feature a YouTube moment, unlike these that focus on them. Additions to my Jimmy Howard collection have been lacking lately, mainly because I haven't had the time to make it out to any card shows or spend a lot of time on ebay. These latest two additions actually came from fellow blogger Sal over at Puck Junk. What I like most though has to be the overhead shot. I don't think there are enough of these used on cards. The puck being right there in the crease makes this one just that much better. Sal was also nice enough to include a sticker from the 2010-11 Panini NHL stickers set. This is the first sticker I've added to my Jimmy Howard collection. The only other stickers I know of in my entire collection are the ones from late 80's Topps sets. These bring me to 17 unique cards (one double) and one sticker. If anyone wants to see all of them, click here for a link to my Howard collection Photobucket album. Finally. I've been waiting for months to post an update for this project. My latest TTM success brings me to two cards total for the Ink Script project now. I sent these two cards to Terry Yake at his home address in Missouri back in October. Yake definitely has an interesting signature. I'm having a hard time actually seeing his name in there, but it looks cool nonetheless. He even threw his number on at the end. And I'm assuming that's the little number symbol to the left of it. I like when players add that. As you can see, both signatures looks pretty much the same, but they have their individual differences. The only flaw with this second one would be how the loop furthest to the right is interrupted at the top. The reason I sent two of the same card was just in case one of them got smeared, I would still have a decent one for the Ink Script set. This time, I got two quality signatures, so one goes in the Ink Script pile and the other goes into my TTM binder. Another shout out to Moody's TTM blog for the address on this one. I picked this card up from a quarter box at a card show a while back and thought I would show it off here. 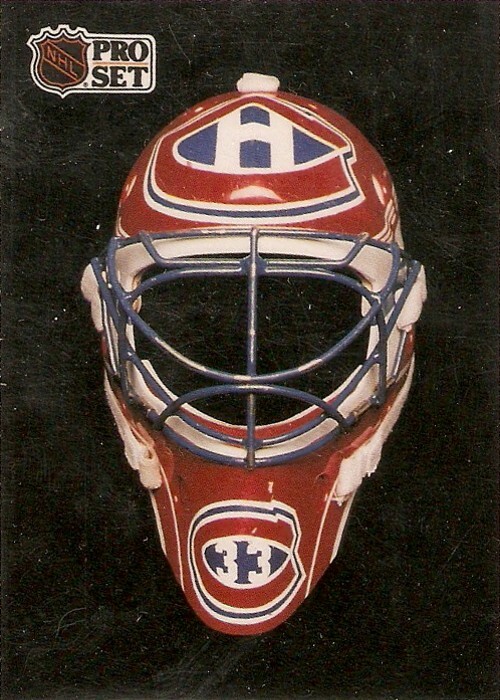 This hidden gem, featuring Patrick Roy's famous Montreal Canadiens mask, was buried within the 1991-92 edition of Pro Set. The back of the card lists this one as number CC2. I'm not sure what that means, if anyone knows can they please explain it to me. Pretty simple design here. I really like how the bleu, blanc et rouge stands out on the solid black background, unlike some of the more colorful backgrounds used for more recent mask cards. 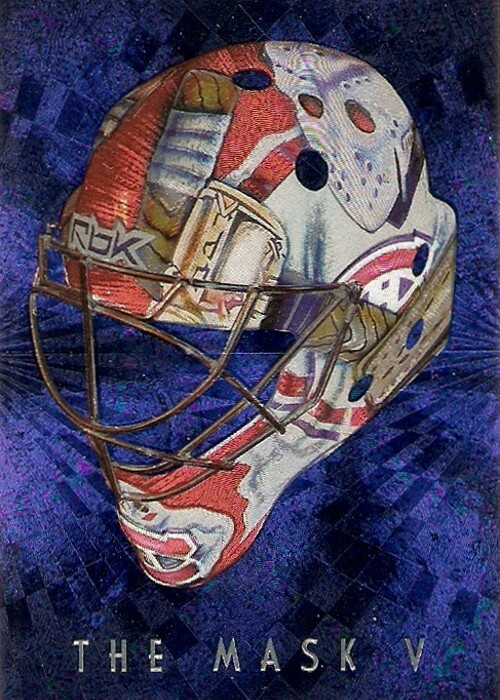 "The battle-scarred facemask tells a compelling story - of 100-mile-an-hour slapshots that didn't make him blink, of flying elbows and swinging sticks that didn't make a difference on the scoreboard. If you look hard enough at this battle-scarred mask, you'll see the ghostly imprint of a pair of Vezina trophies, three Jenning's trophies and two Trico trophies as well as a Conn Smythe trophy for the playoff MVP in 1986. You'll see a pair of first all-star team appearances and a second all-star selection. And most importantly, you'll see the shadowy image of a Stanley Cup victory - climax to his first full season in the NHL. 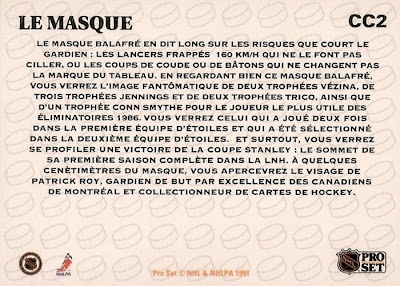 And a fraction of an inch behind the mask, you'll find the face of Patrick Roy, Montreal Canadiens goaltender par excellence and a hockey card collector." 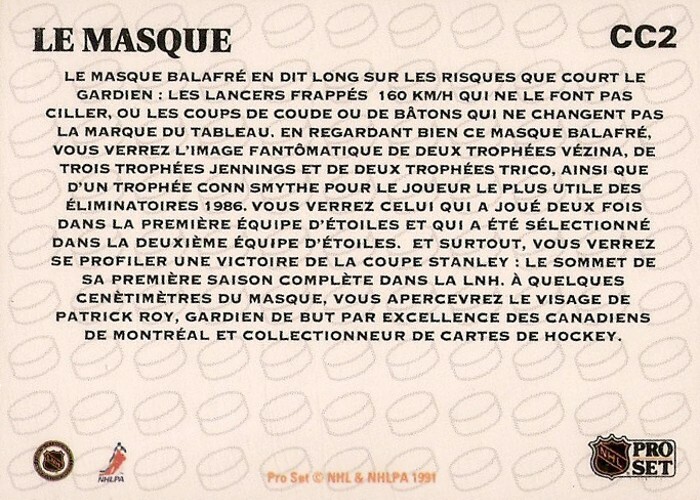 At the bottom, at least on the English version, it also says the mask was designed by G.K. in Detroit, Michigan. Now that's something I never knew. 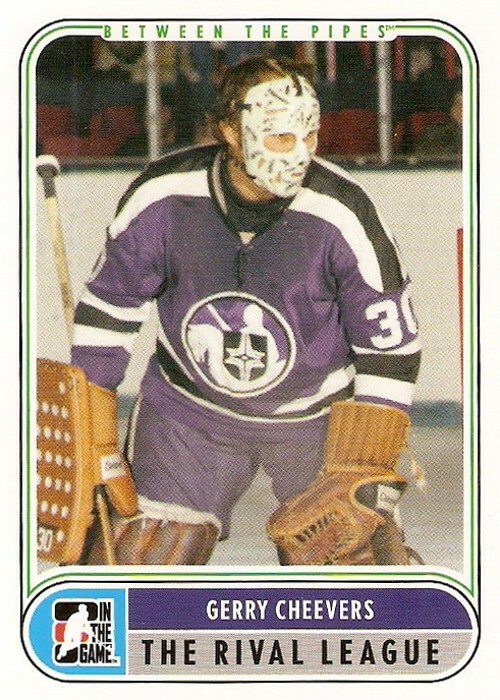 I believe this is the first "Mask" card of it's kind, as it predates the 92-93 Pinnacle Masks subset by one year. Someone please correct me if I'm wrong though. There could very well be some even more obscure card at any point in time prior to this. It's taken nearly two months now, but this is the fourth and final box I purchased at the Gibraltar Trade Center card show back on the weekend of New Years. 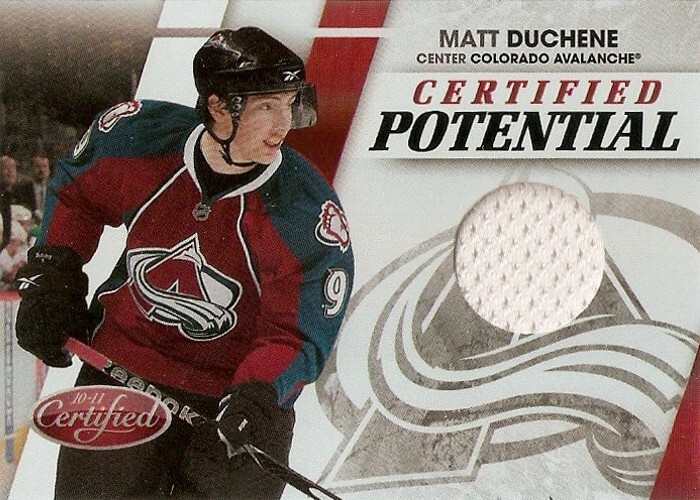 I had seen so many Certified breaks on SCF, that I just really wanted to check it out for myself. I kind of like the base set design. The shapes at the bottom of the card give it an interesting look, and the grey/black/white color scheme is nice because it works with all of the team colors. The only thing I don't care for is the size of the Certified logo. 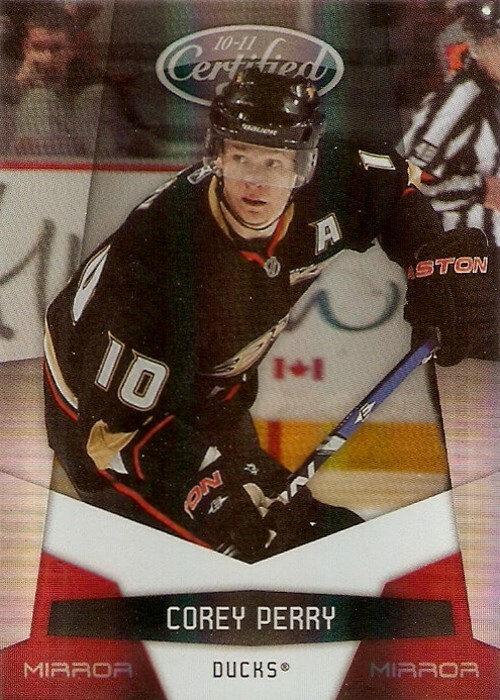 This Corey Perry, numbered 048/250 is the only red mirror parallel I managed to pull. There's not much to say about these other than the fact that they are a shinier version of the base card with a little bit of red thrown in. Just like with the mirror red parallels, I only got one of these mirror blue parallels: this Vincent Lecavalier numbered 098/100. Same thing as the red, it's just a shinier version of the base with some blue thrown in for good measure. Talk about a misleading set name. 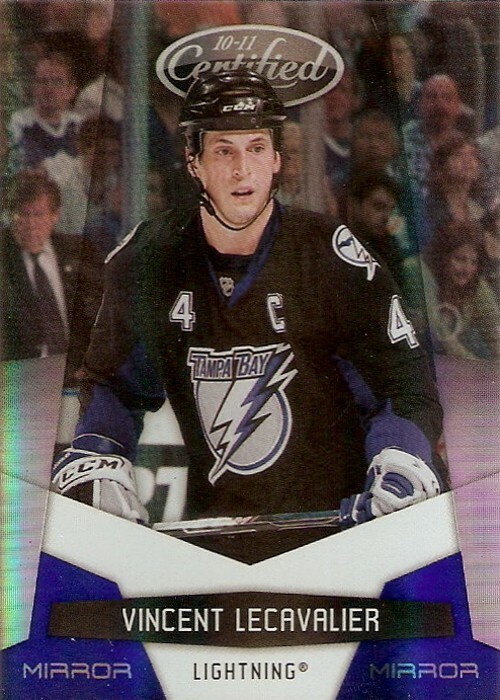 There are no jersey swatches to be found in this set, just these mediocre designs. The idea for the set is nice, but what killed if for me was the massive blank space at the bottom because Panini was too lazy to create separate designs for auto'ed and non-auto'ed versions. These are a bit better than the Throwback Threads, but not by much. I do like the shattered glass effect though, it's perfect for this kind of set. 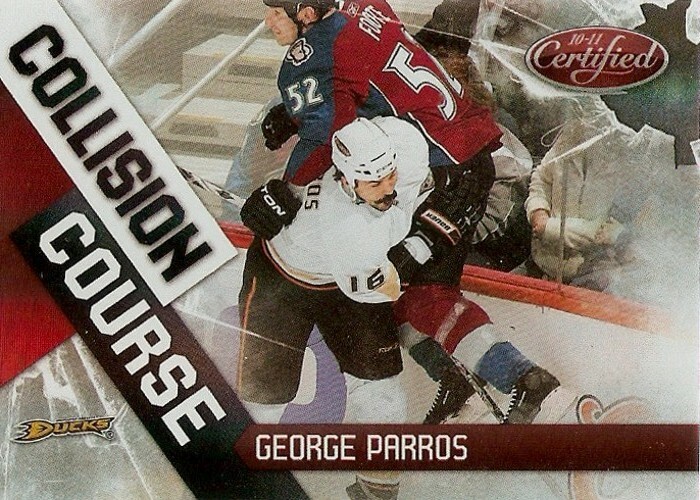 I really like the photo on this George Parros too. I wonder what some of the others look like. These are probably my favorite of the insert sets. 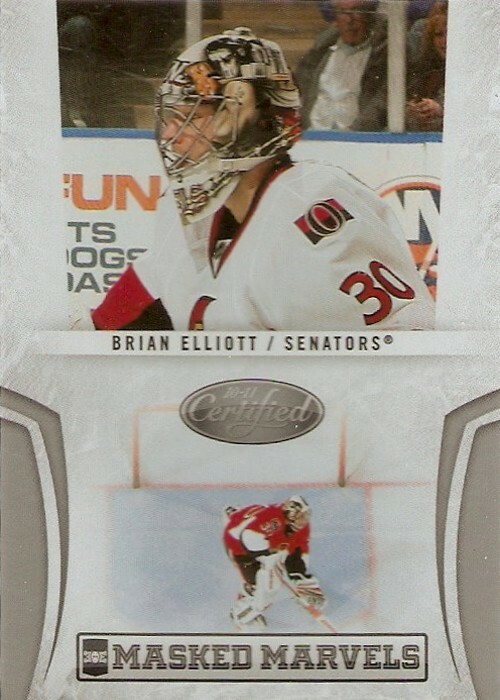 I only got one with this Brian Elliott numbered 117/500. I like the idea for this set, but they should have done a better job of capturing the masks, especially and awesome one like Elliott's with Casey Jones. I only got one of these and it's another no-name guy for me. 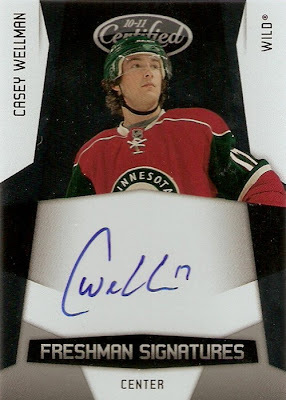 This Casey Wellman is numbered 069/1299. At least it's hard signed though, must have been fun for him to sit there and sign 1300 of these things. Now we're getting to the better hits of the box. This Antoine Vermette is numbered 20/50. 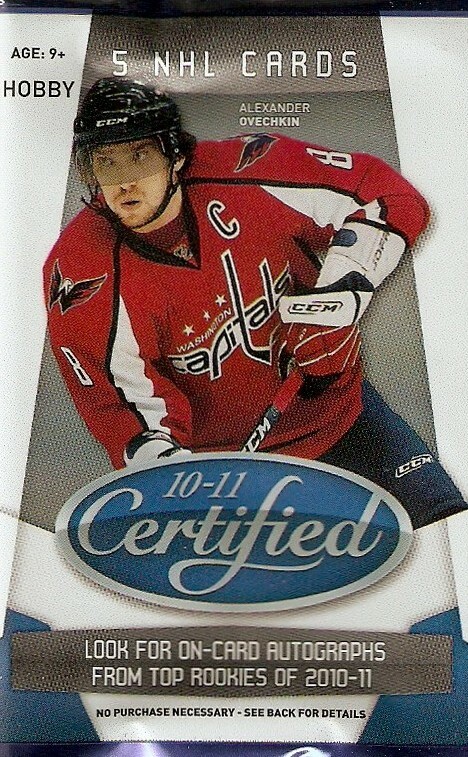 It's the exact same thing as the regular mirror blue parallel, except for the addition of the sticker auto. 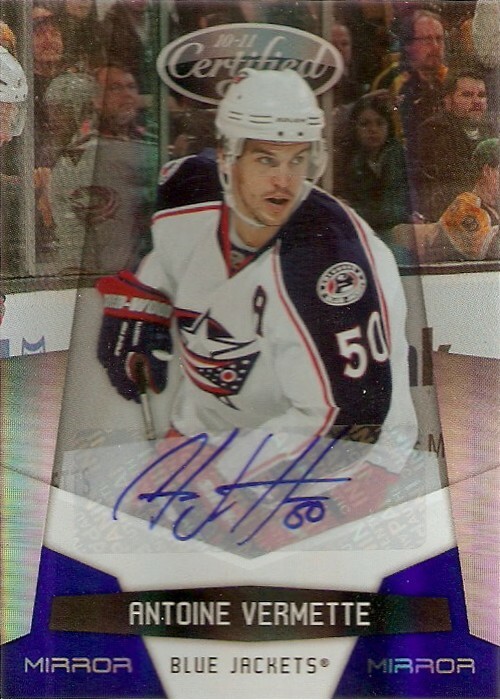 At least Vermette has a halfway decent signature. This was the first memorabilia card to pop out of the box. 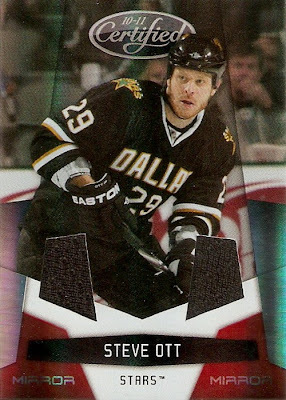 It's a Steve Ott numbered 067/150 and it's got two plain black swatches that kind of blend in with the picture on the card. Not the best combination if you ask me. This would have to be the hit of the box for me. It's a Matt Duchene numbered 91/99. This one's got a plain white jersey swatch, but hey what can you do. At least it looks better than the standard Potential cards with all that empty space there. Overall, this box wasn't too bad. I got a lot of nice base cards, no Jimmy though, so that kind of bummed me out a little bit. Other than that, there were some cool looking inserts and some nice auto/memorabilia hits, but nothing overly spectacular. 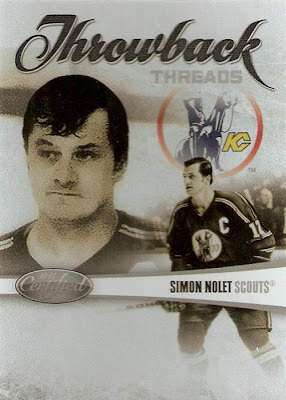 My recent Hextall TTM success reminded me that I scanned this next card a while back just for this series. 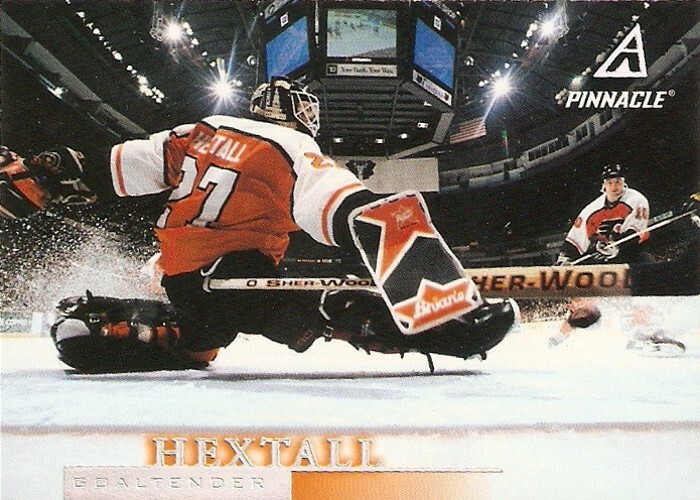 It's Hextall's card from 1997-98 Pinnacle. I have always thought this was a great looking set. This particular card features an awesome net-cam shot taken just as Hextall is trying to make a save. 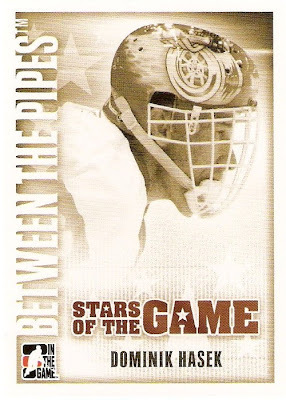 What makes this one even better is the snow spray on either side of Hextall. Another cool thing about these net-cam shots is sometimes you can see the jumbotron and get another angle of the same play. Even though it's hard to even see the big screen, it's still pretty neat. I also have to say I like the fact that this is just a base card that happens to have the net-cam shot, and not a themed set like the Net Cam cards from this year's Score set. I have wanted to do this for the longest time, but never got around to it until recently when I had some time to sit down and go through my box of traders, so I now have an updated trade list here on the blog. It's in the list of pages on the sidebar of the blog. Here you can find all kinds of auto's, jerseys, and rookies that I'm looking to get rid of. This pick is another one that just caught my eye, although that isn't necessarily a good thing in this case. 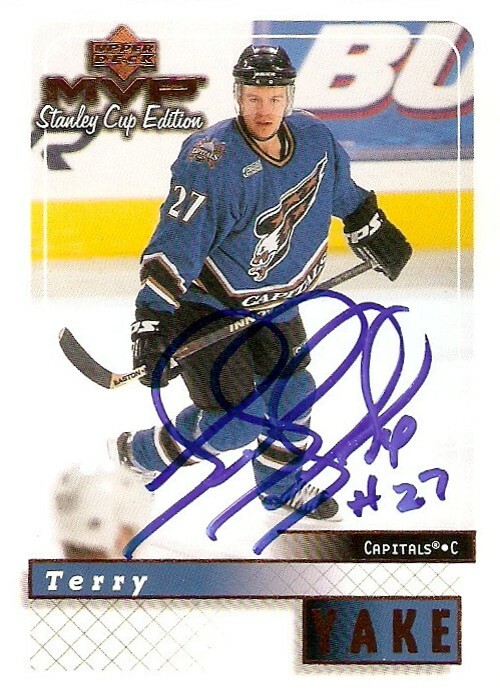 The card I'm referring to is a Todd Simpson base card from 1997-98 Upper Deck, and it ain't pretty. I'm not exactly sure what UD was thinking with this one. I know sometimes cards are meant to show players off the ice, kind of like this Trevor Linden over at My Hockey Card Obsession, but this is ridiculous. Seriously, who wants a hockey card picturing the guy reading the newspaper? The card itself isn't all that bad, in fact I kind of like this particular design from Upper Deck, but the picture just completely ruins the whole thing in this case. Anyone have any other cards like this that aren't worth the cardboard they're printed on? This is the third of four boxes I picked up a few weeks ago. 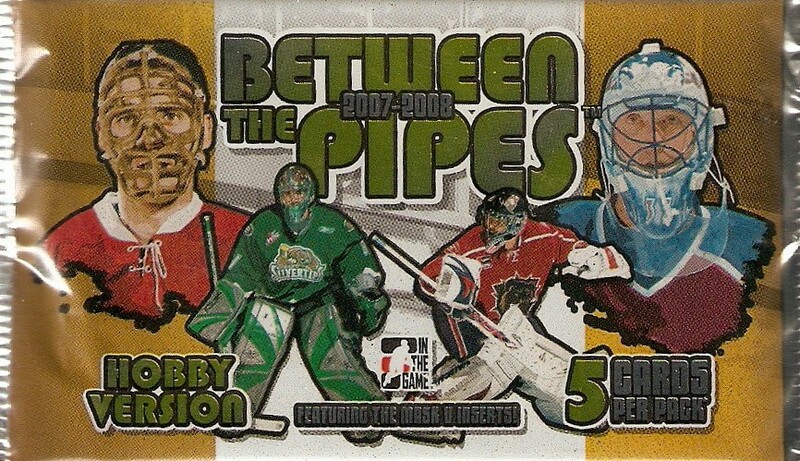 I've never even purchased a pack of Between the Pipes before so I didn't really know what to expect. All I knew was I had a chance to pull a Mask card and that was enough for me. I kind of like the design they went with for the Future Stars set, especially the way the background of the picture is black and white, leaving the player image to stand out. 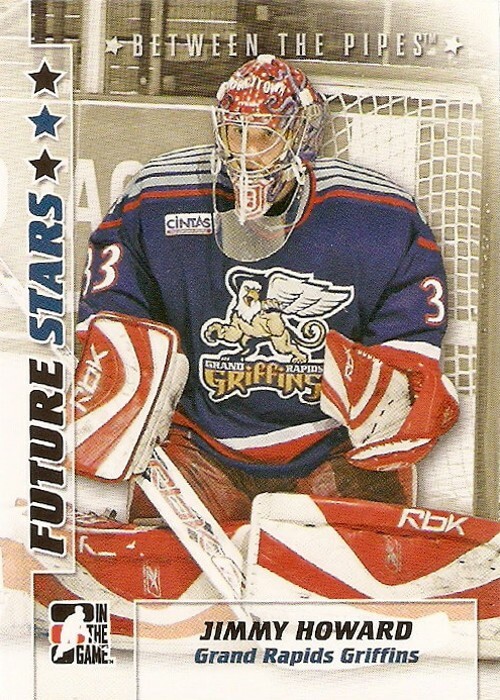 It was also a plus that I pulled this Jimmy Howard for my collection. Now that I've started actively looking for Hasek cards again, this was another nice addition to my Hasek collection. I like these cards for some reason, especially the way the image is tinted. It's also pretty neat how they made the center of the A's stars. These are nice, too bad they couldn't find a picture of Sawchuk wearing a mask for this one. Either way, he is definitely one of the greats of the game. The WHA was way before my time, as I'm only 22, so it's interesting for me to see the teams and uniforms from a league I never knew. This Gerry Cheevers stood out to me because of the purple uniform and his famous stitches mask. 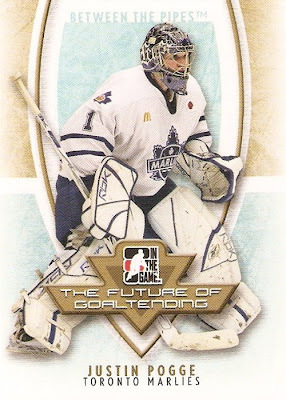 I'm not sure why there is a future stars then a future of goaltending set, but either way this one doesn't look all that bad. I like how the design comes down to a point at the bottom of the card as well as the way the colors faded toward the edges. I've liked these since I purchased the Howard from the set and was happy to pull two of them in Pekka Rinne and Drew MacIntyre. Notice they use the exact same background on all of the cards from this set, and just crop the player image into it each time. These cards are the reason this box appealed to me for the price I got it at. I only got this one, but I'll take it as I'm happy to add any mask card to my collection. I think this edition of The Mask is one of the best with the blue background and simple silver foil text. I didn't know what to expect memorabilia wise from this box, so I was pretty excited to see this pop out about half way through the box. 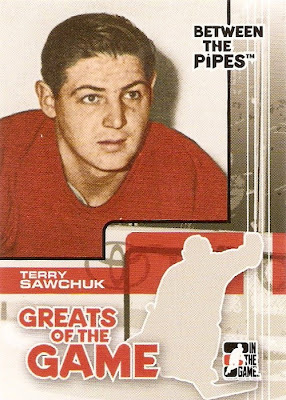 Supposedly there are only ten copies of this card out there, but it's not numbered anywhere on the card itself. 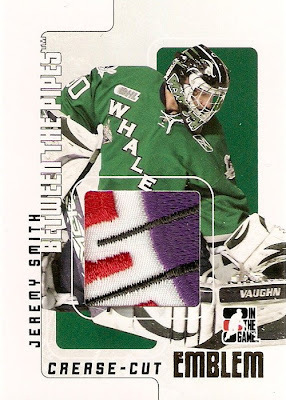 The four-color swatch is from the 2007 Home Hardware CHL/NHL Top Prospects game. This is now the lowest numbered card in my entire collection and probably the nicest patch card I've ever pulled. I've never heard of Jeremy Smith before, but that doesn't bother me, plus he played for a local team, the Plymouth Whalers, so that's cool. This was by far the best of the first three boxes from the show. It had some nice base cards and subsets, then a few autos and an awesome patch card. Can't complain about that. I definitely would not be opposed to picking up another box or two of this stuff next time. 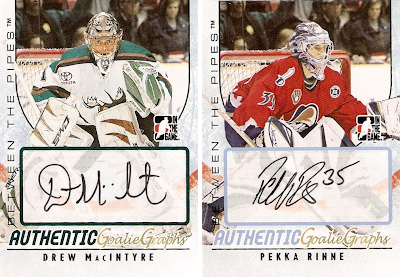 After just about two months with no responses, I've added two more signatures to my TTM goalie collection. I sent these two cards to Ron Hextall c/o the Los Angeles Kings back in May of last year. Hextall is one of the better goaltenders in league history. He began his career with the Flyers back in 1986-97, appearing in 66 games going 37-21-6. 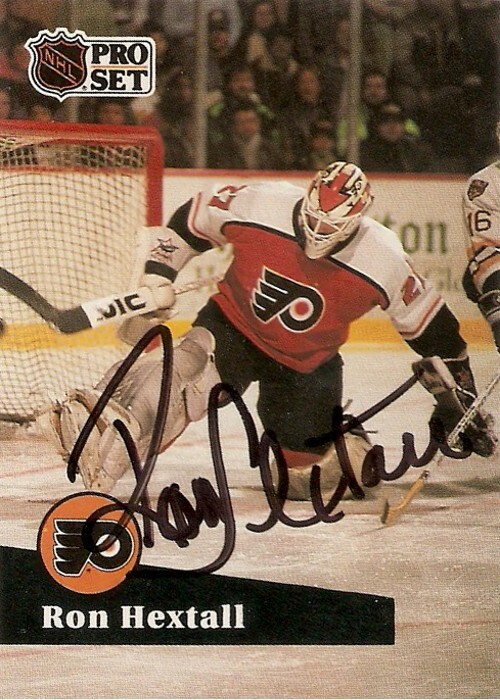 He stayed with Philadelphia until 1991-92, after which he moved onto Quebec for a season then Long Island for a season. 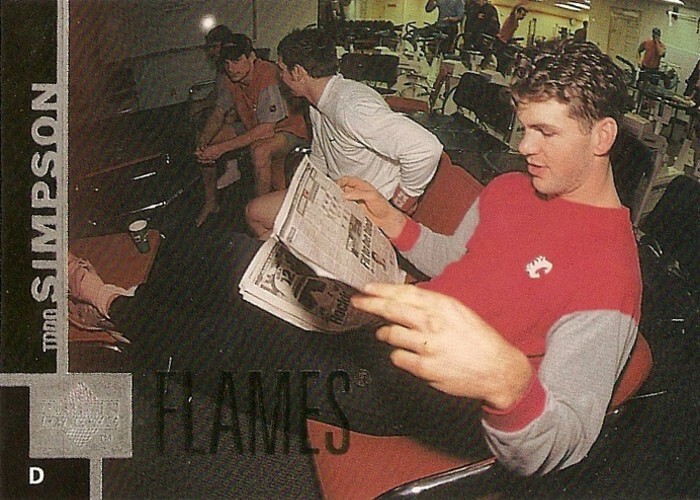 He returned to the Flyers for the 1994-95 season and would go on to finish his playing career there. As a Red Wings fan, I will always remember his from the 1997 Stanley Cup Finals. And who could forget the two goals he scored? Now onto the cards I sent. The first is from 1991-92 Pro Set featuring a nice shot of Hextall making a kick save. The second is from 1997-98 Score. This one is the first of any of my TTM's to have something other than just a signature with the "Best Wishes" text, at least that's what I think it says. As far as the masks on these two cards, I would have to say I prefer the one from the Pro Set card, just because of the vibrant orange and white color scheme. 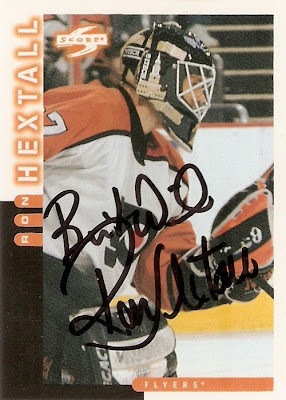 I have to say Hextall has one of the nicer signatures I've received so far with my latest round of TTM attempts. It's fairly readable and I really like how he uses the huge sweeping "R" at the beginning.